Yes, as much as the established rule and the media would like to convince you otherwise. Felix is still actively campaigning. 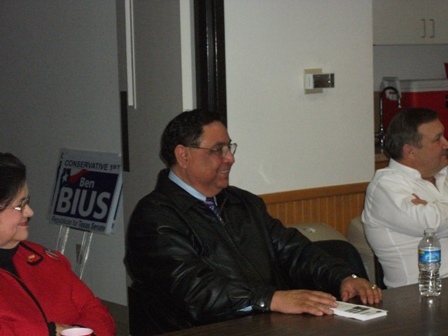 He was in Granbury Wednesday evening visiting with local Democrats. He will be in New Boston this Saturday, Feb. 20. It is shameful, and I believe the greatest travesty this election year (of course, more so than in past election years) has been the democratic establishment failing to allow access to the democratic apparatus by all democratic candidates, who mind you… paid $3750 for the privilege to carry the label DEMOCRAT. Granted it has always existed as is, but few candidates ever took the time to speak the truth about their experience with the democratic machine and the social elites. The media elites, and corporate elites share blame in promoting this travesty. Robert Michels believed that any political system eventually evolves into an oligarchy. He called this the “iron law of oligarchy”. According to this school of thought, modern democracies should be considered as oligarchies. In these systems, actual differences between viable political rivals are small (what we have in Texas-no difference) the oligarchic elite impose strict limits on what constitutes an ‘acceptable’ and ‘respectable’ political position, and politicians’ careers depend heavily on unelected economic and media elites. Thus the popular phrase: there is only one political party, the ‘incumbent’ party. Thus when the people have the opportunity to choose from one of their own, the notion is quickly suppressed and the candidate(s) quickly reduced to flakes. Further, a rising of a similar personality (an impersonator) quickly appears to satisfy the urge to recruit someone from the masses. Perhaps, in past elections the democratic party was more a party of the people, or more tolerant of difference, (that is a big perhaps) but the struggles that many Texans currently endure are the result of years of poor and biased leadership under the “good old boy” rule. We have not been under Republican rule for too long, but I believe we have been under the “good old boy” rule far too long. A rather happy trend that social elites and their groupies wish to perpetuate. The democratic establishment had a great opportunity to allow the people of Texas to choose the best candidate by promoting all the candidates, but instead they went with the status quo… and provided voters with only bacon drippings…that taste good, but are not good for you. As far as they are concerned only the anointed merit any attention, and the millionaire can take care of himself. Rather than allow the voter to choose, the established democratic rule did not show the common people an ounce of respect by allowing them to choose their own representation. Do keep in mind that a variety of online unreliable polls will always favor the anointed candidate over the others (typical and expected), they are nevertheless unreliable polls that warrant miniscule merit outside their readership. Now, it was not too long ago that another mediocre democratic social elite was favored as the front-runner. He handed his reign over to another mediocre social elite. It is a given that the social elites will always favor and endorse their anointed candidate, but remember it is also the social elites that for better or worse have been in control (in Texas mostly worse) and it is time to break from their rule and choose a candidate that will actually work for the people and not for their crony friends. more later…. This election cycle we have a choice to keep with indifference or make a difference. Democrat Time to Walk the Talk – Free-Press-Release.com. Wait folks! Felix is the only candidate with a plan! Yes, Felix is the only candidate with a plan to address the critical issues facing us… a daunting task even for the current leadership that have consistently fallen short and to date fail to rise to the occasion… All we have to do is turn around to see the failures of our current leadership. Nowhere is it more visible than in south Texas. We did not make it to the bottom by sheer luck. It took years of hard work, and neglect to get here. There is plenty of blame to go around. While the anointed and the millionaire have been filling the airwaves with empty rhetoric, empty punches and receiving their due reward, Felix has been steadfast at presenting solutions. While the establishment rule has worked diligently at promoting their worn out strategies to elect “one of their own” Felix has impressed upon us all that we, the people are highly capable of choosing our own leaders. Felix presents solutions for education from the heart of the problem. He did not gain insight into the problems in the classroom from any secondary source. Felix is close to the working men and women who struggle to maintain a remnant of the American dream. Felix knows the ills that plague our health care system, our military veterans and our seniors. Someone once said that “Mediocrity requires aloofness to preserve its dignity (author: Charles G. Dawes).” Well, mediocrity is not what we need in Austin. We need someone who offers workable solutions. The old phrase “Where’s the beef?” describes the platforms of the only two candidates that merit any attention from the democratic establishment. We do not need someone who can pay off for not delivering on a promise. We do not need another mediocre leader in Austin whose campaign tactics take us back fifty years. We do not need a leader in Austin who has to be seduced to lead, or who bows to the demands of deep pockets. We need someone with actual leadership skills. We need someon e committed to the people and who will diligently pursue, and put into action solutions to our current problems. That candidate is Felix Alvarado. He has proven himself steadfast and committed to presenting real solutions to real problems, while the anointed and the millionaire have been diligent at promoting the status quo. March 2, 2010 Texans will have a choice… Keep with indifference or make a difference! The only real choice is Felix Alvarado. via SA Current – Blogs. are bloody affairs..as Felix likes to note. The White Sham scam is buying up air time to spread their agenda, force feeding it to Texans and it’s considered newsworthy. I said their agenda, because their want to be governor has little to do with addressing the needs of Texans. Running for office, raising money is all well and good, but we already have plenty of career politicians that do that quite well, and well…let’s face it…how well has that worked for the people of Texas? We’ve had Texas millionaires run this state. How has that work out for Texans? I find it interesting to note how many candidates, especially those that are part of the political elite identify with the common people, when they are so far removed from the struggles of ordinary citizens. We…we…we…turn that w upside down and the truth is revealed. Career politicians stay focused on the “me” lane. If one race falls through…there is always another one to pursue. Texas is long over due for a leader with vision and direction that will address the needs of all Texans. Texans need a leader who can say what he can and will do, and then do it. Texans deserve a leader who can stand on his own merit. Look around this state, and you will see that few politicians have little reason for boasting about their political records. As Texans we need to hold all our elected officials accountable for our current situation. We need someone in Austin who has not been bought out by big money. We need someone who can be objective and efficient. We need a leader that can stand strong against the status quo. We need to remember that the status quo mission is to support a system that favors a particular group of people. It is does not identify with any particular party. Not all Texans are struggling during this economic downturn. Not all children attend substandard public schools. Many Texans are covered by affordable health care plans. For these Texans, the level of concern, and the reason for concern over these issues may be vastly different, but this is where we need a leader that can stand strong against the status quo that merely seeks to pursue the interested of a few. We need some different. We don’t need the stereotypical politician. We need someone who can identify with the people of Texas! We need Felix Rodriguez Alvarado! At this point, we have spoken to many democrats and non democrats and many are not supporting either candidate included in the KERA Debate. At this point, many Democrats are passionate about their candidates, but more so hopeful those candidates… far removed from “politics as usual” are willing to stand up against the status quo. The sentiment is pretty clear… politics should not be a career. Obviously, the arduous task of assessing candidates should not be left to an organization that is more representative of those raking in the profits from political campaign spending and not the voting population. And where is the response from the TDP? You have to wonder what the role of the TDP is in this instance and how much influence they had, if any in the final selection criteria. Some (a.k.a. the anointed) may feel $3750 is too low a fee for people wishing to run for office, but it sure is too high to pay for the privilege of being excluded from such an important Democratic event, one that would benefit all voters. So let’s keep it real! If we follow the lead of the corporation and choose according to who spends the most money then clearly, Democrats can go home and sit out the rest of the election, because no one is going to out spend Perry nor KBH! Even if they do, spending an obscene amount of money has not been proven to be a marker of success for statewide democratic candidates. If that were the case, Tony Sanchez would be our current governor and instead of having a breeding farm of young Hispanic political hopefuls, these same hopefuls would be running for statewide office today instead of waiting around for the numbers to favor their candidacy. Hispanic or non Hispanics, young or old, what we need are individuals that are concerned with the needs of the many and not the needs of the few. Democrats should follow the GOP lead and insist that newcomers to the political scene be allowed to debate. This is where strong leadership must rise to the occasion. In true Texas tradition those at a disadvantage are conveniently ignored. This needs to change. We can do better! Think about it, isn’t that what this whole election is about, inclusion? When we look at the issues, the GOP looks to protect its own interest and not the interest of all Texans. The aim in 2010 is to nominate the most competent, most popular candidate, not the one with the most money spent, or the one with his hands in the pocket of supporters. Surely, we can see the effect of nominating and electing someone simply because of dollars collected and dollars spent. Allowing KERA and its sponsors to limit debates to who spends the most money narrows the opportunity for voters to evaluate all the candidates. In either case, the debate becomes nothing more than a strategic assault on the people of Texas forcing them to pick and choose between what the corporation (KERA is a PBS affiliate) assesses as viable candidates. Once again big business is dictating how Texas should be run. It makes no sense to spend millions of dollars for a losing effort. Where is the data suggesting that any one democratic candidate is ahead? So we can conclude that the only requirement used for determining inclusion in the democratic debate was a candidate’s “newsworthiness.” according to a non-existent non-partisan poll. Regardless, there are Democrats out there, although few in numbers that believe the party is, of the people and for the people. They invite candidates to come speak to their members, regardless of who they personally support, because after all the people must make informed decisions. For the most part, the media does look at each candidate not so much for viability as for presentation. The fact that candidate’s purchase much of their air time is not “newsworthiness.” So KERA is stating that a candidate’s credibility and competence is determined by the media profit and not the voter. For KERA, a building and staff constitute campaign activity, yet in the case of democrats winning elections, or rather losing an election, a campaign office is not critical factor. In today’s technological and virtual world anything is possible including running a statewide campaign. . .
Again, clearly, the only driving force behind the democratic race is money being spent on corporate media, since relevant qualifications, integrity, and competence were not considered. First, the fact is there is no poll that shows that any democratic gubernatorial candidate is ahead. If there is one out there…it is time to release the results. The possibility of a runoff is extremely high. Second, what this debate does represent…is one person being elevated above everyone else for political purposes and the receipt of free statewide publicity. Third, this is a political ambush of the candidate with the most money and the only democratic challenger with the monetary means to fund his own campaign. Wrong is wrong no matter which way you paint it and this is wrong! This concerns all Texans. All gubernatorial candidates need to speak up on behalf of their constituents and demand inclusion of all democratic candidates willing to take part or have KERA cancel the Democratic debates. Contact Ilon Goddard at KERA. His number is 214-740-9336, his email is igoddard@kera.org. My name is Felix Alvarado.